Shoppers Tab is the PUP that uses misleading techniques to prevent removal. Use Reimage to locate malicious components and get rid of them faster than with uninstall instructions. A full system scan blocks virus reappearance and prevents traffic to malicious domains. The program which is responsible for delivering Shoppers Tab ads might collect information about the users and share it with third parties. Shoppers Tab (also known as ShoppersTab.com virus) is considered to be a highly annoying potentially unwanted program (PUP) which has adware and browser hijacker characteristics. Once installed, it starts to load useless ads for the user in a form of pop-ups or banners and also changes default browser's start page domain to www[.]shopperstab[.]com/ext/index.html. It usually adds Shopping New Tab – B extension to victim's browsers as well. 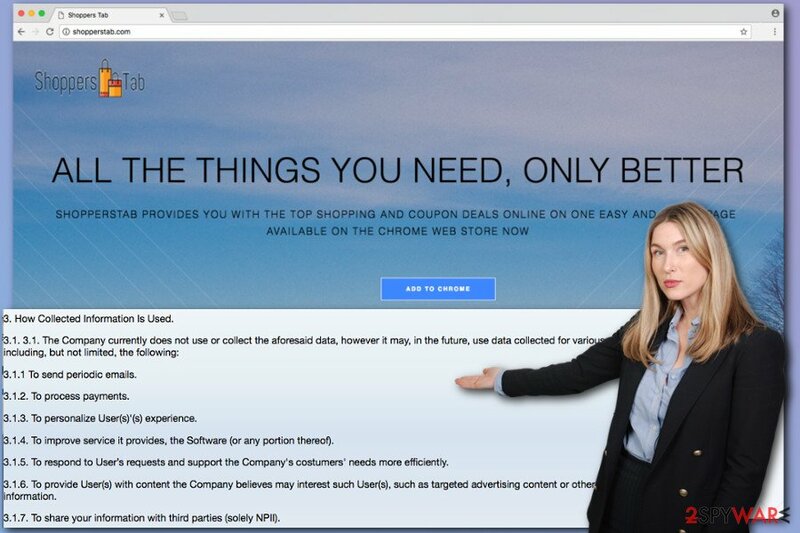 There are two main reasons why ShoppersTab ads might disturb your browsing sessions. One of the reasons is that you might have installed this suspicious application to your computer that offers to deliver great offers for online shopping. Another reason is that some adware program sneaked inside your computer and caused chaos on your browser. Nevertheless, this application promises to provide links to the online coupons and cash-back providers, various online shopping deals based on your recent product searches and other offers. However, the application is not worth trusting. 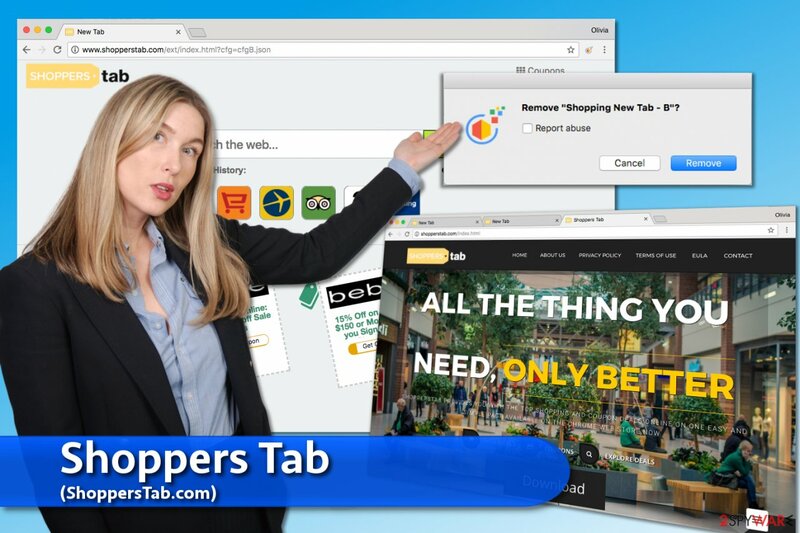 Shoppers Tab generates intrusive online ads that prevent from normal browsing the web. Pop-ups, discount coupons, banners and other advertisements might cover the whole screen, do not have a close button and follow you wherever you go. These ads desperately seek your click. Developers of the ad-supported programs generate revenue from the clicks, and that explains an excessive amount of commercial content on the browser. However, the biggest problem is with PUP's redirect tendencies. These ads are supposed to redirect to the third-party websites where you can get your promised discount or purchase a particular product. Though you might end up on phishing site or get infected with malware. Instead of being useful, these ads might be dangerous. Bear in mind that adware employs “virtual layer” that allows delivering ads even on a legitimate and reliable websites. Thus, you can easily get tricked into clicking a malware-laden ad. What is even worse is that in 2017 the program was updated and started changing victim's homepage to ShoppersTab.com. This questionable domain suggests using a search engine which always appears in browser whenever the user launches Chrome, Firefox or another browser. Also, the search engine attempts to persuade the victim to use it daily as it also sets itself to appear on the default new tab page as well. Please, do not ignore the suspicious activity of the described program and remove ShoppersTab.com virus as soon as you can. This way, you will get rid of unwanted browser hijacker and adware which will result in safer and faster browsing experience. Shoppers Tab virus adds Shopping New Tab - B extension to victims browsers and changes default homepage address to shopperstab.com. Consequently, it starts serving bothersome ads in a form of pop-ups, banners or search results. If this program sneaked inside your PC without asking permission, we recommend scanning the computer with Reimage or other reputable anti-malware/anti-spyware program. There’s a possibility that other potentially unwanted programs found the way to your PC too. However, if you prefer, you can get rid of the virus without additional software. At the end of this article, you will find manual Shoppers Tab removal instructions. Many computer users claim that the described adware started intrusive activities out of nowhere. However, it’s not true. People always participate in virus or PUP infiltration directly or indirectly. 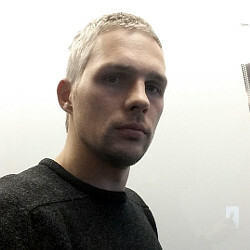 This cyber infection is not powerful enough to spread and attack computers on its own; thus, it uses a help of other programs. Nevertheless, this application has an officials website; direct downloads are not the main distribution way. Usually, Shoppers Tab hijack occurs when a user installs freeware or shareware using Quick or Standard installation settings that do not openly disclose about additional downloads. Using this setup, all optional components, attached to the software package, are installed by default. To stop adware and other potentially unwanted programs from entering the system, you have to opt for Custom/Automatic setup and monitor the process. Shoppers Tab virus, just like any other potentially unwanted program, can be eliminated from the system in two ways. The first method is manual. It requires to investigate computer’s system and look for the adware-related components. Once you find them, you have to delete them. Manual Shoppers Tab removal might seem like an easy task; though, you might be surprised how many third-party apps were installed PC and your browsers without your knowledge. Our illustrated instructions below will guide you through this procedure. In case this task seems complicated or requires too much effort, opt for the second method and remove Shoppers Tab automatically. Install anti-malware program and scan the computer. Don’t forget to update the program first! Carefully follow the instructions. If you leave some of the adware-related components, these annoying ads might appear again. Don't forget to check all your web browsers, not the one you always use. Here, look for Shoppers Tab or any other recently installed suspicious programs. It's uncommon that Mac OS X users encounter ads by Shoppers Tab; however, if you see them, please follow these steps to get rid of them. Wait until you see Applications folder and look for Shoppers Tab or any other suspicious programs on it. Now right click on every of such entries and select Move to Trash. Remove Shopping New Tab – B and other suspicious add-ons from the Internet Explorer as shown below. When in the new window, check Delete personal settings and select Reset again to complete Shoppers Tab removal. You should fix Microsoft Edge as soon as you notice traces of the described hijacker in the browser. The guidelines below will help you to do that. Once these steps are finished, Shoppers Tab should be removed from your Microsoft Edge browser. Check the list of extensions and remove all suspicious extensions, plugins, and other similar entries. Look for the ShoppersTab and similar applications. Here, select Shoppers Tab and other questionable plugins. Click Remove to delete these entries. Now you will see Reset Firefox to its default state message with Reset Firefox button. Click this button for several times and complete Shoppers Tab removal. From the list of extensions, remove Shopping New Tab – B, Shopping New Tab – D and other suspicious entries. They might be responsible for flooding your Google Chrome with an excessive amount of ads. Here, select Shoppers Tab and other malicious plugins and select trash icon to delete these entries. Click Reset to confirm this action and complete Shoppers Tab removal. Uninstall all unknown extensions from Safari. They might be responsible for delivering the annoying ads. Here, select Extensions and look for Shoppers Tab or other suspicious entries. Click on the Uninstall button to get rid each of them. Here, look at the Homepage field. If it was altered by Shoppers Tab, remove unwanted link and enter the one that you want to use for your searches. Remember to include the "http://" before typing in the address of the page. Now you will see a detailed dialog window filled with reset options. All of those options are usually checked, but you can specify which of them you want to reset. Click the Reset button to complete Shoppers Tab removal process. ^ Adware. ClintonPcHelp. Computer security services. ^ What is 'Cash Back'. Investopedia. The source of financial content on the web, ranging from market news to retirement strategies, investing education to insights. ^ Internet security: phishing, fake emails & hoax websites. Optus. Mobile Phones, Broadband Internet, TV, Home Phone, Tablets. ^ Francis Navarro. Top Story: Fake Amazon ads hiding in plain sight all over the web. Komando. Tech News, Tips, Security Alerts & Digital Trends. ^ Sachin Dave. Most malware attacks were carried out through advertisements: Kaspersky. Economic Times. Business News, Financial news, Stock/Share Market News, Economy News, Loans & Banking. This entry was posted on 2017-10-31 at 09:08 and is filed under Adware, Viruses. You can quickly scan the QR code with your mobile device and have Shoppers Tab ads manual removal instructions right in your pocket. How did you remove Shoppers Tab ads?